List of Countries » United Kingdom » England » London » old "Hôpital et Dispensaire Français"
The building of the old "Hôpital et Dispensaire Français" in London can still be seen at 172-176 Shaftesbury Avenue. The building now hosts the Covent Garden Hotel. "The French Hospital opened in 1867 in a building near Leicester Square for 'the benefit of distressed foreigners of all nations requiring medical relief'. It soon merged with the nearby French Dispensary, which had been founded in 1861 by Dr Achille Vintras. 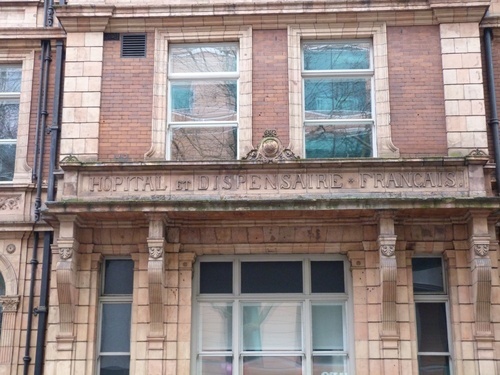 The establishment was then known as the French Hospital and Dispensary. In 1878 the building was enlarged, but the premises had become inadequate and a new building was required. Funds were raised for the new Hospital, with generous donations being received from many ambassadors and even the French government. 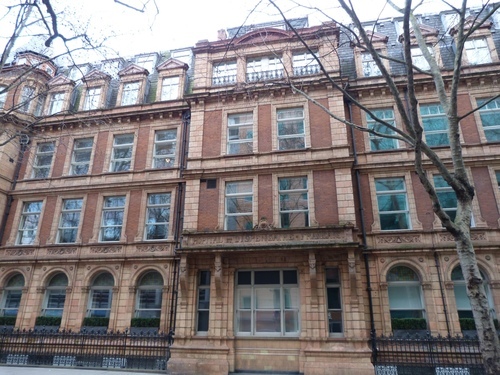 In 1899 work began on the new building on a site in Shaftesbury Avenue and, in the following year, the purpose-built Hospital opened, with 50 beds. The building had to be enlarged in 1893 and again in 1910. Patient accommodation was increased to 70 beds. During WW1 it became a section hospital of the First London (T.F.) General Hospital; 30 beds on the top floor wards were put at the disposal of the War Office for wounded British soldiers. Here, for the first time, they received coffee for breakfast instead of tea, and apparently appreciated it. (…) By 1966 the Hospital was in deep financial trouble and was forced to close. The Ministry of Health bought the building in 1967 and the French Hospital became the Shaftesbury Hospital, joining the three P's group - St Peter's, St Paul's and St Philip's Hospitals - specialising in renal disease. The Hospital, with 39 beds, closed in 1992 when the St Peter's Hospital Group was absorbed into the Middlesex Hospital"1. - Nick Black, Walking London's Medical History, The Royal Society of Medicine Press Ltd, London 2006, pp. 19, 123 and 150. 1. Retrieved from "Lost Hospitals of London".